By now Apple's app-store approval process is legendary for being completely untethered from anything even vaguely resembling consistency, accountability, or transparency. App makers can often find their passion projects banned for no coherent reason whatsoever, or because the app in question competes with Apple's own offerings. The process of complaining is traditionally semi-Sisyphean, with Apple often refusing to adequately explain their decisions. And it's inconsistent; banned apps and games can often reappear with no concrete explanation as well. "An Apple App Store reviewer told Choffnes that “your app has no direct benefits to the user,” according to screenshots reviewed by Motherboard. According to Apple’s reviewer, the app contained “Objectionable Content,” a catch-all for apps that Apple doesn’t want to let into its App Store. Apple is blocking the app and no one is quite sure why, including Choffnes; neither Apple nor Verizon responded to requests for comment for this article." Coffnes, who is paid by ISPs like Verizon to test their own network video performance, is collecting data on how ISPs manipulate data to manage video on their networks, a practice that's increasingly common as ISPs increasingly test the boundaries of net neutrality (or, as is now the case, the lack thereof) and good taste. 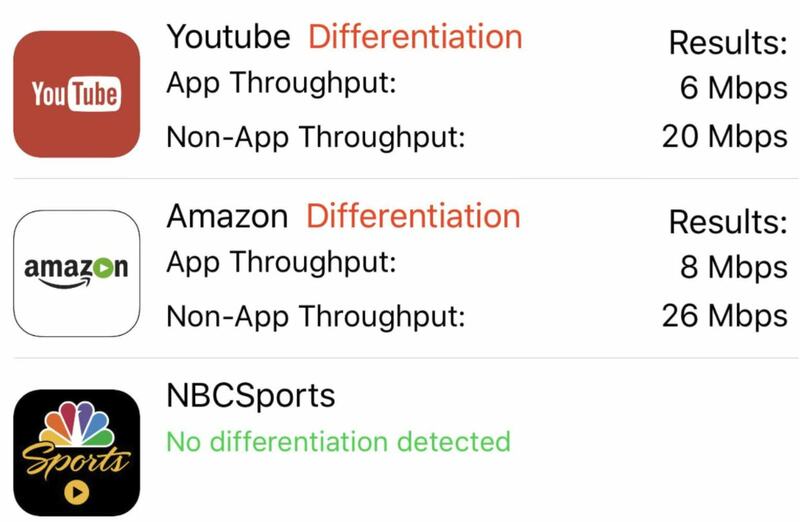 Coffnes' app simply connects to and analyzes data throughput from seven apps: YouTube, Amazon, NBCSports, Netflix, Skype, Spotify, and Vimeo. It then reports if the ISP you're using is somehow manipulating or throttling back network speeds as an effort to provide some layer of transparency to the end user. Neither Apple nor Verizon were willing to comment about the apparently arbitrary ban, raising obvious questions about transparency. These sort of tools are, it should go without saying, going to be important as the government increasingly makes it clear it has zero real intention of protecting consumers from lumbering, predatory telecom duopolies eager to abuse a lack of sector competition for additional financial gain. With government now sitting on its hands in fealty to telecom providers, the onus is on the consumer to do due diligence regarding their own connections. "Most attempts by ISPs to block or throttle content will likely be met with a fierce consumer backlash … in the event that any stakeholder [ISP] were inclined to deviate from this consensus against blocking and throttling, we fully expect that consumer expectations, market incentives, and the deterrent threat of enforcement actions will constrain such practices." Right. But it's a little hard to do that when you lack the choice of an alternative provider, or the ISPs that are available aren't clear about their network management practices, something net neutrality rules required. There's certainly plenty of legitimate network management practices, but just as often network management can be used as an anti-competitive weapon. Determining which is true requires the help of researchers like Coffnes, and Apple's adding another layer of non-transparency to the equation by banning useful consumer tools and apps for (once again) no coherent reason. "The conversation was very pleasant, but did not provide any insight into the review process [that] led the app to be rejected in the first place," Choffnes told us in an email." It seems the decision making in these large net/tech companies is completely opaque and Kafkaesque. It's a great idea btw but it could let users add other stuff to test. As for Apple, more of the same? Good thing public backlash works on them. If Verizon objects, is it now objectionable content? After all, someone has objected. Even if they don't object, it's objectionable... but I expect all the ISPs bribing lawmakers to repeal net neutrality will object to this (maybe not openly). Karl shouldn't be pretending that there's some objective measurement of objectionability. Their lack of transparency and not many choices due to their walled garden of a app store is why I call them crapple. What do you blame for your lack of originality and maturity on this issue? Are you forgetting... This is the internet. But, the sad thing is he probably did think that was a witty and original thing to say. Filed under the heard-it-a-thousand-times dept. Why don't we call it Everybody Hates Raymond? Remember the Net Neutrality Comment Bots? App could've been mass-flagged as inappropriate but similar mechanisms. In fact maybe the same mechanism. App bans like this are often automated without review. Only a "maybe" though, I accept this sounds conspiracy theory-ish. Re: Remember the Net Neutrality Comment Bots? If they realize the only way for people to find out what's being throttled or not is internal tests, then you'd need an app for it to work on an iPhone, at least. Bandwidth app = no benefit. Thank G I am an Android user. There is an app for the detection of ghosts? The app is live now. and subsequently named Apple for net neutrality violations. Another typical Techdirt piece: OVER before the next is out! Techdirt's incoherent topic selection, apparently chosen for least possible importance and time-span, is not going to supply those alleged 27 Bangladeshi per day with enough entertainment to return. This is thin gruel without gruel or even water. And readers have to wait 3 hours until even see another empty bowl! Re: Another typical Techdirt piece: OVER before the next is out! Put down the crack pipe and step away from the table. I'm sorry someone told you that this is a breaking news feed. Tens of millions of people, hundreds, thousands and more apps. How many bodies are behind the algorithms? Stuff like this will happen, and will happen again and again. There is no magic algorithmic solution, it takes time for the the code to ask for human intervention. It takes longer when the algorithms aren't flushed out and accurate. Only time (experience) will reduce the error rates after humans determine what is legit and what it to be rejected. In this case humans complained, humans responded. Problem solved. Apple being unwilling or unable to coherently explain how apps are approved is in the companies DNA and dates back to approval processes for extensions in the Apple OS'. "But it's a little hard to do that when you lack the choice of an alternative provider, or the ISPs that are available aren't clear about their network management practices, something net neutrality rules required. " A worse than useless app if we assume its data is inaccurate. Not simple to measure network speeds and throttling. Simpler to pretend to do so. Re: But does it work? From what I've read about it, yes it summarizes how your ISP handles files differently based on header information and TLS settings. It does NOT measure throughput of apps on your phone as many summaries assume. It supplies the same file from the researcher's servers twice: once with and once without popular streaming headers attached. If the file transfers consistently slower when it says it is from Netflix, but doesn't when identified as originating from CBS Sports, then it's a good be your ISP is filtering/throttling Netflix data based on that header information. Re: Re: But does it work? "...it's a good bet your ISP..."
We also had problem with our app - https://agilie.com/en/projects/sharktaxi. It was banned for no coherent reason. We spent a lot of time fighting this. Finally we got this: Apple's bizarre app store approval process, the company has backed off the blockade, but has failed to explain what resulted in the app being banned in the first. It's just a terrible situation.